Lightweight, low-profile wraparound design with two stays, rigid and spiral, for comfort and custom fit to address pathology. The enhanced universal wrap-around neoprene design provides a low-profile comfortable, custom fit that is both functional and simple. The design combines two stays, rigid and spiral plus a movable elastic strap to address various pathologies of the thumb including Tendonitis, Basal Joint Arthritis and instability of the CMC (Carpometacarpal) joint. The elastic strap may be wrapped between forefinger and thumb to help stabilize the CMC joint without restricting the use of the thumb or wrist. Bilateral fits right or left thumb. Do you have a thumb brace that does NOT have any metal or plastic but still supports the thumb ? The Procare Universal Thumb -O- Prene does have a removable stay. Daughter is experiencing thumb and wrist pain from practicing with her flag in color guard. Will this help support and still continue to allow her to spin her flag? Yes, your daughter can wear the Thumb-o-prene brace during color guard. The brace contains 2 flexible aluminum supports that are removable to adjust for the level of support she needs. I have a brace on both hands for stability and my physician recommends this site. I was told that I needed a short brace so will this keep my wrist stabilized. Recommendation needed. Do you need something for your thumb because the Universal Thumb-o-prene will support the thumb and wrap around the wrist? If you need something just for the wrist the DonJoy Wrist Wraps may work for you. Can it be worn in water (surfing)? Yes, it can be worn in the water. Will this splint provide enough support to keep tendons involve in flexion/palmar add. from sitting in a shorten position? My thumbs are bad on both hands. Can this be switched between each hand? The Procare Universal Thumb-O-Prene is designed to fit either hand. It can be switched between the right and left hand at any time. I have arthritis of the thumb will these be ok to use? Will I able to still play badminton wearing this brace? Yes, the brace was designed flexible enough to be worn while playing sports activities. I have a wrist that seems swollen right underneath the hand; I pulled too hard trying to get my compression socks over my ankles; I also have a right thumb that is growing towards the left at the tip and a right index finger that is leaning towards the right also at the tip. 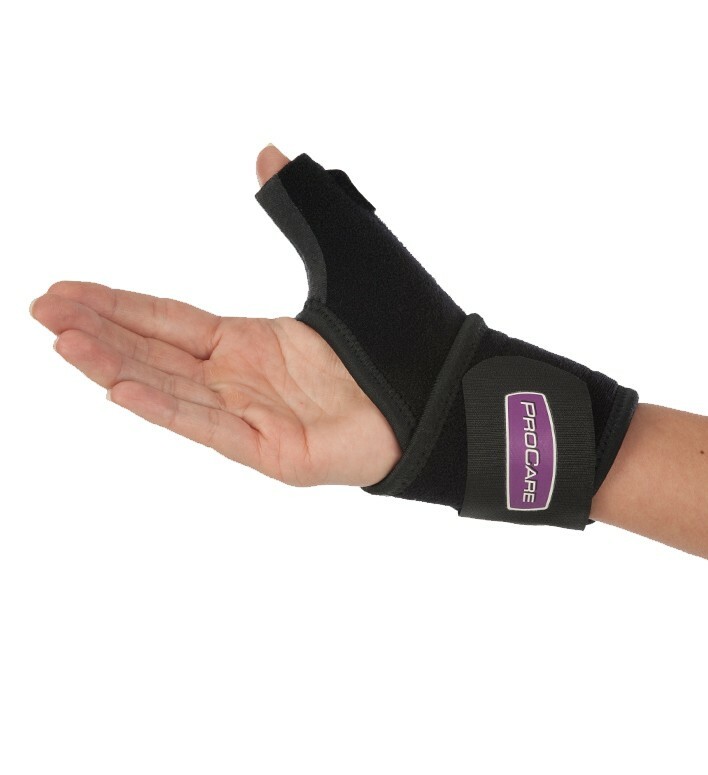 I am looking for a brace that can keep my thumb and index fingers straight up and keep my carpal muscle nicely supported at the wrist as I sleep and possible wear it daily when not in water or cooking...can you help me find a brace that will do that so I don't get real crooked fingers? I am 64 yrs old and need a small. Universal Thumb-O-Prene™ and a finger splint would be recommended for your condition. Does this work on either hand? Yes, the ProCare Universal Thumb-O-Prene works on either hand and all sizes. I have purchased 3 of these and use them during my different daily activities with the 2 different metal support inserts. They are more comfortable than other devices and hand wash well, but the construction around the top of the thumb is week and thin and will start to separate after sometime. The brace that I use during limited day-to-day activities where thumb movement is limited holds up well. The other 2 which are used when a large amount of thumb activity is necessary such as yard work or construction do not stand up well and are beginning to fray at the inside top of the thumb. I still find this one to be one of the more comfortable thumb braces available. This particular product is not well made around the thumb area. I have had two braces within 1 month and both of them pulled apart at the inside seam around the thumb. The brace needs to be reinforced around the thumb area - particular around the top and around the seam. This is bar none the best brace for stabilization and relief from thumb joint issues. For the price, this brace works but it is not as supportive as I need. Pros: Easy to put on. Can adjust the tightness. On a small wrist, the Velcro on the brace can cause chafing and soreness because it extends to far over the top of the hand. Pros: The brace has really good support for the thumb. Cons: The Velcro part needs redesigned for small wrists. I have a severely sprained thumb. The "Thumb-O-Prene has given me comfort and support and I wear it a lot. There were some earlier postings of failure in the sewing. I can see where that might be be case but mine has held up very well. They had to be talking about the extra support velcro strap. Hard to keep sewn the cloth and harder fabric tab. So far so good and I like it a lot. Pros: Support, ease of use, ease of cleaning optional metal support. I wear these at night because I have arthritis of the basal joint. They support well and are pretty comfortable. Holds my thumb at just the right angle. It travels with me -- I never know when I'm going to need it. Pros: I may buy a second -- I don't want to be without.